After I was trying to work with the already included textures of ik2ik, I was sick of having only a small amount of textures which are actually fitting each other and are a very ripped down texture-set. That's why I searched over the net and tried to find the textures which are also belonging to the same pack. After a quite large amount of time, I bumped into this website and found just what I needed. I hope this makes those old textures back in the running again. Because they currently are never getting used in nearly any official maps while they do deserve better. I would like to thank Iikka "Fingers" Keranen for these beautiful textures. I don't need any credit for this at all and I'm not caring about ratings. I do care about if they would be used in one of your maps. So use them and credit Fingers! Be sure to read the license before using the texture-pack! via electronic media (Internet, FTP, BBS) only. Commercial use, ie. anything that involves any kind of payment from the user, is prohibited. textures remain my property, and the above restrictions still apply. a non-exclusive commercial license can be possible. - Provide a preview map. - Add an original screenshot. - Perhaps I will make some bump-, spec- and height-mapped textures for them. Let's see what happens first. - Included the carpet-textures as proper decal textures (.png-format instead of .jpg) and as mapmodels (so they can be rotated and placed where ever you want). - Cleaned up some textures. - Included some of the mapsounds which are in the original map, called ikzdm1. - Provided a preview map. It is "playable", yet not recommended. - Provided a screenshot which is truly made with Cube Engine 2 (instead of Q3Radiant). Nice to see some attention after all (texturepacks often just get downloaded but no feedback provided). Please be sure not to use exec packages/ik2k/package_add.cfg but rather copy-paste it into your map's config-file as there is a featured update coming along which includes the carpets as models (so you can rotate them way better than as a decal) and a very different arangement (some textures deleted due only being a low resolution version of the very same texture, some added with different shadersettings). Always do this for custom content actually, else your map may be incompatible after an update. It surprises me that Eisenstern didn't use the painting textures, as it would fit the theme perfectly (but other themes as well). Unfortunately, I can't really make any use out of the textures. Although it's hard to admit, there are no texturesets within Sauerbraten which carry an indoor theme (like carpets, decorations or things like plinths). Of course there are some textures in several directories which fit into profile, but they are quite limitating. Why is it hard to admit? 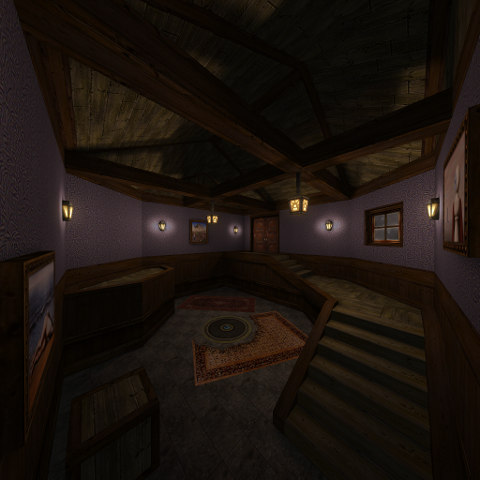 It's the whole purpose of the game to have textures that do not scream "NARROW INDOORS ENVIRONMENTS" like this does, because if they are more spacious than they should they would both be unrealistic (not a strong point of the game anyway) and even if the map was made to fit the aim of the textures, the gameplay is far too fast for it. You'll see with my preview map that such gameplay isn't too fast for Sauerbraten, neither narrow. People just seemed to forgot such theme. It's quite obvious they did as the textures itself aren't really of a high resolution (typically old Quake 3 matching pixel ammount of 128 or 256). So the textures with a higher resolution are more often a first choice than those. Nevertheless, they work teriffic for texturing and look splendid as long as they aren't combined with high resolution texture sets or advanced shader-settings (like lunaran, trak5, nieb, yves_allaire, philipk, gor, etc). This should be it's final release (unless I'm crazy enough to create bump-, spec-, and height-mapped textures for all of those textures). Perhaps I'll add diagonal versions of certain textures as well, but probably not. Get them while they are still fresh!